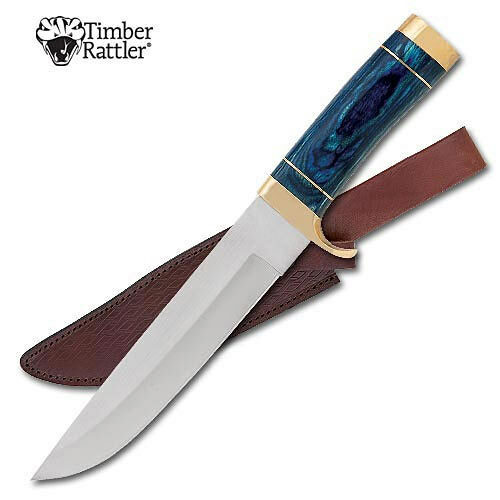 Colorado Blue Stag Hunter | BUDK.com - Knives & Swords At The Lowest Prices! This great looking hunting knife packs a lot into one package! The 7 1/2" drop point blade is solid stainless steel with a keen edge. The knife offers a brass single guard and pommel that provide protection and superb overall balance to the knife. The handle is blue bone stag and not only provides a distinctive look, but a sure and comfortable grip. This hunting knife is extremely functional, looks great, and feels just right in your hand. It includes a leather sheath with snap fastener and wide belt loop. 12" overall. Timber Rattler, TR66.